Old Marina is both an easy way to access Mono Lake, and also the site of important historical events that shaped the protection of Mono Lake. 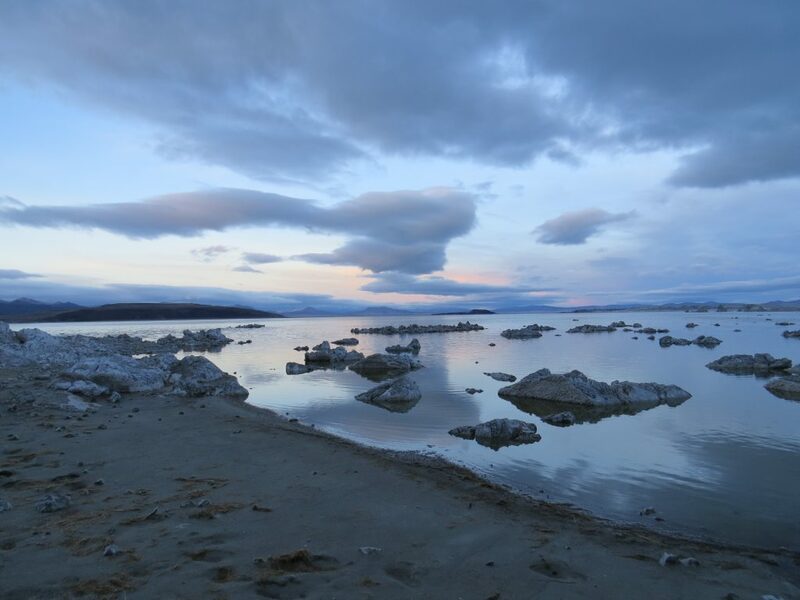 There is a fee of $3.00 per car to park at Old Marina as it is part of the Mono Lake Tufa State Natural Reserve; the site also has public restrooms and a picnic table. For directions to Old Marina, click here. Pumice-block tufa shoals at sunset. Photo by Nora Livingston. Old Marina is where the historic Bike-A-Thons and re-hydration ceremonies occurred. 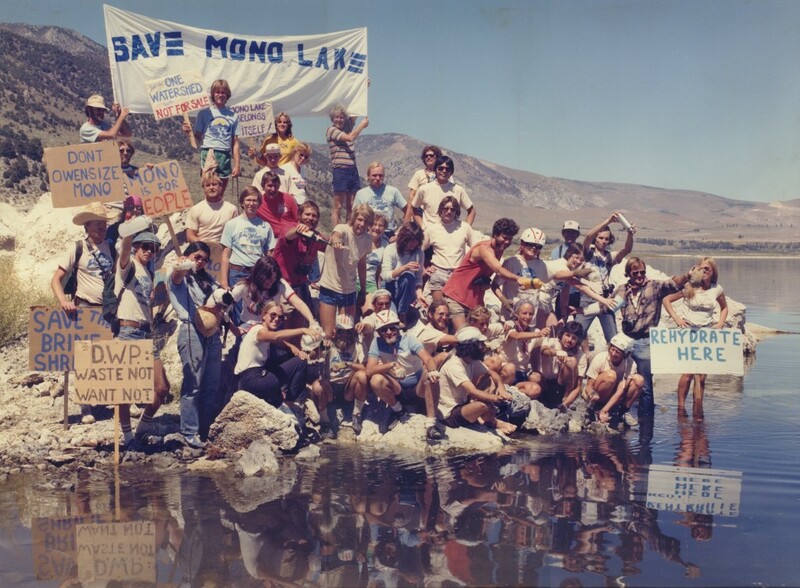 When it became clear that the battle between the Los Angeles Department of Water & Power and the Mono Lake Committee was going to last a while, fundraising efforts were bolstered. One inventive tactic was the Bike-A-Thon–cyclists scooped vials of water from the reflecting pool in front of the DWP’s headquarters in downtown Los Angeles and biked to Mono Lake, bringing the water “home” while raising money to support the Committee’s efforts. Cyclists scoop up water from the reflecting pool in front of DWP. MLC archive photo. 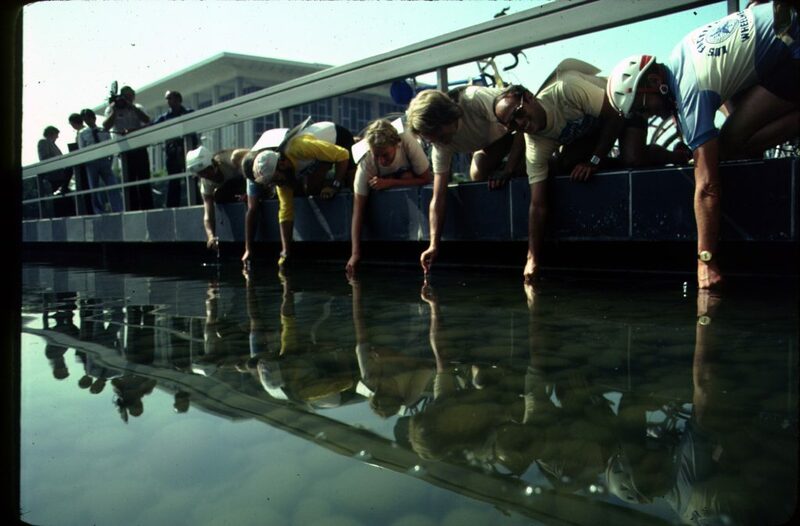 Cyclists pour water into Mono Lake at a re-hydration ceremony in 1982. Photo by Stephen Johnson. 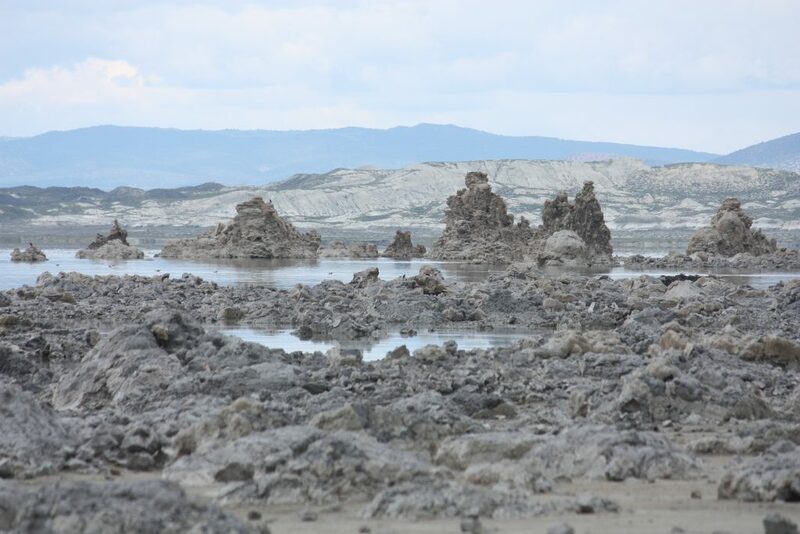 Located just one mile north of Lee Vining, off Highway 395, Old Marina has several large tufa towers and stunning views of Mono Lake’s islands. If you’re lucky, you might even catch a glimpse of some nesting Osprey! 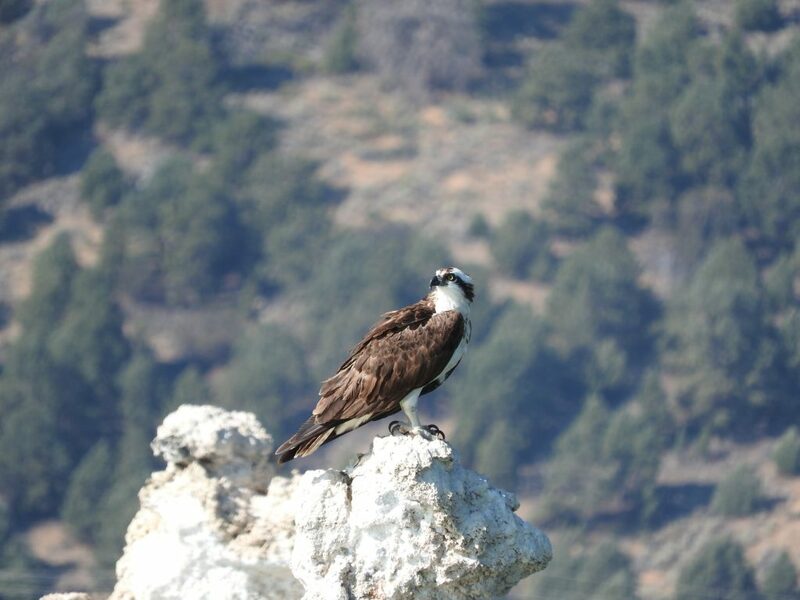 Osprey are large birds of prey that nest on tufa towers in Mono Lake. Photo by Sandra Noll. There is a short trail to the water and a handicap-accessible trail to the David Gaines Memorial Boardwalk. The trail between Old Marina and the Mono Basin Scenic Area Visitor Center is currently undergoing trail maintenance and is closed. If you’ve already visited South Tufa, you may notice some of the tufa towers at Old Marina look slightly different than those at South Tufa. Many of the tufa towers at Old Marina are actually pumice-block tufa. 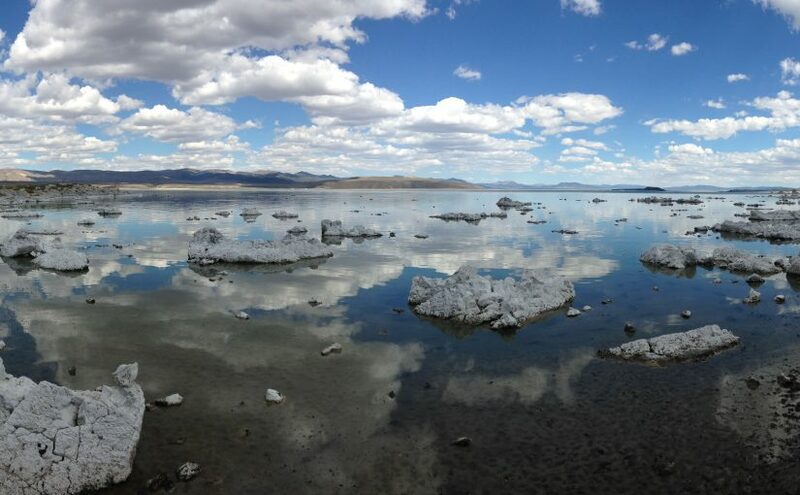 When Negit, the darker and smaller island erupted, large pieces of pumice floated across Mono lake and eventually moored themselves on the lake shore. Once the pumice made it to shore, the same calcium and carbonate reaction that form tufa towers; occurred on the large pumice blocks, creating the pumice-block tufa we see at Old Marina. Experience the unique pumice-block tufa at Old Marina and enjoy stunning views of Paoha, Mono Lake’s largest island. Photo by Erv Nichols.